How to Use WPF Controls Inside an Excel Actions Pane? (1) The Microsoft site mentions some video -with the exact title that matches my requirement- but all videos in that web site have been removed, it seems. 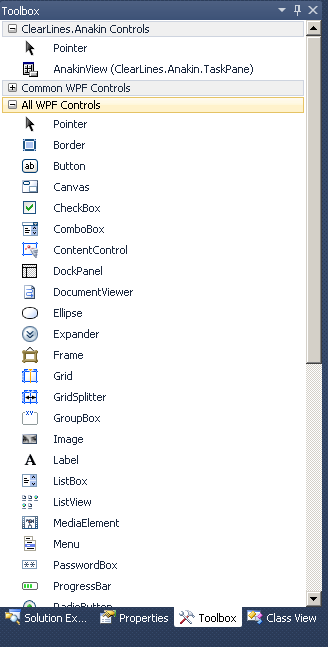 Based on the above screenshots, and other sites, I have come to the conclusion that the missing link, the connection between my WPF UserControl and its appearance in Excel is some ElementHost. Your problem is that you are trying to place a WPF Control inside another WPF Control. 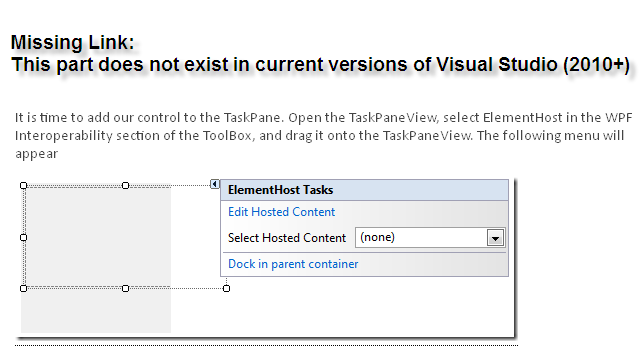 Notice that the section ElementHost Tasks has been renamed WPF Interoperability but it is otherwise very much alive. I'm not sure why you think there's a "missing link". The ElementHost is the standard way to host WPF content on winforms, and it's perfectly documented in the link above, and also here. C# VSTO: How to block a user from interacting with client (Excel) for a brief period? How do I create 3D text in a 3D ViewPort object in a C# WPF project?